Named for their brilliant color and beak-like face, the blood parrot cichlid is a large, docile variety of cichlid. Because of their shy nature, you may not see much of your cichlids if they're in the tank alone. Providing a school of dither fish will encourage your blood parrots to come out of their hidey-holes. Blood parrots are timid cichlids that will spend a lot of their time hidden away behind plants or rocks. 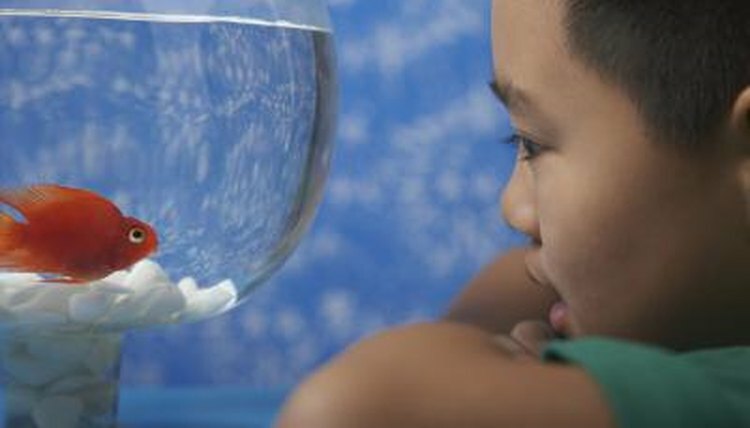 Adding dither fish to the tank will help your blood parrots feel more secure. Dither fish are a school of active, peaceful fish that swim in the mid- to upper-level of the tank. Blood parrots will gauge the security of the tank based on the dither fish -- if the schooling fish aren’t alarmed, then the blood parrots will feel the aquarium is a safe place to swim. For any variety of schooling fish, you’ll want have 6 to 8 fish minimum, but a larger school of 10 or more will keep your dither fish the healthiest. Danios are commonly used as dither fish because they are active and peaceful swimmers who get along well with blood parrots. Zebra danios are recognized by their silvery body and dark stripes. They only grow to about 2 inches, which is big enough to keep your adult blood parrots from making a meal of them. Giant danios are a little larger, about 4 inches full grown. Their bodies are silver with blue and yellow stripes along their side. Make sure to have a tight fitting lid if you choose danios. They are excellent jumpers and sometimes escape an uncovered tank. Barbs are another schooling fish that make great dither fish. Rosy barbs are a peaceful, schooling fish that grow to about 5 inches in length. Rosy barbs are silvery-red and add a splash of color to your tank. Cherry barbs are bright red and only grow to around 2 inches. Tiger barbs should be avoided since they may nip at the fins of the slow-moving parrot cichlid. Freshwater rainbow fish are not only colorful, they also are ideal dither fish for parrot cichlids. In the store, they may look pale due to the stress of living in a small tank, but when you bring them home their blue, purple, red, orange and yellow colors come to life. Rainbow fish are adaptable and hardy, and typically grow between 2 and 6 inches depending on the variety.